Approximately 9 inches / 229 mm wide. The 'I' in the model number stands for ivory. The 'W' in the model number stands for walnut, as in cheap imitation of walnut wood made from Bakelite plastic. 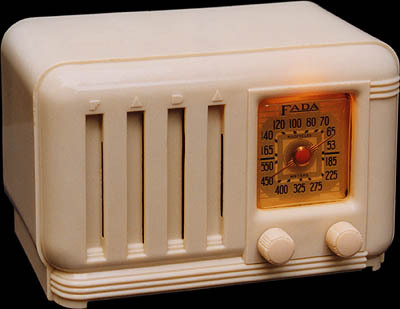 Nowadays plastic-cabinet radios, with their streamlined shapes, are more desirable to many collectors than wood radios. 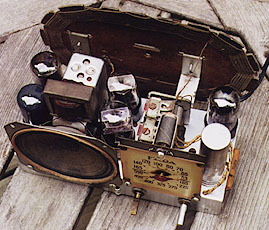 This is the walnut radio's chassis. It cleaned up beautifully, and looks nearly like it just left the factory. 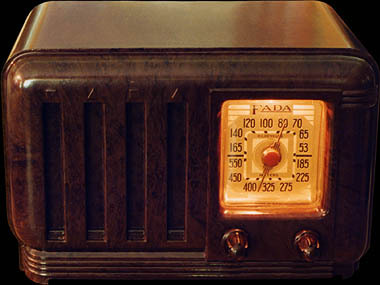 Also, this radio is still operating on all of its original parts. Not a single resistor, capacitor or tube has been replaced. Extraordinary.